BASeCamp Programming Blog BASeCamp Programming Blog - Multi-lingual when he wants to be. BASeCamp Programming Blog - Multi-lingual when he wants to be. “Dark Mode” settings have started to be a big ticket concern for the last few years. Applications and Apps have started to add “Dark Mode” Visuals as an option, and more recently, Mac OS X (Now Mac OS, because that’s not confusing when you are interested in old software/hardware!) 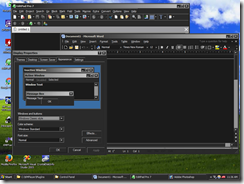 as well as Windows 10 have introduced their own “Dark Mode” featureset in the OS. However, I’ve found Windows 10’s implementation confusing and actually a bit disturbing. To explain, I’ll start at the beginning. Graphical Environments in general have held to an idea that, for the most part, standard Graphical elements were managed by the OS. For example, on the Macintosh you would create software and it would use standard buttons, listboxes, etc. and the behaviour of those is handled by the OS. Your software didn’t have to handle detecting mouse clicks, drawing the button, changing it’s appearance when it’s clicked, etc. This concept was of course shared by Windows. 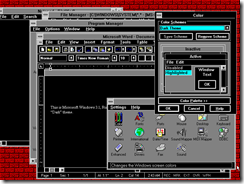 on Windows 3.0 and 3.1, the system had “System Colors” that defined how different elements were drawn. 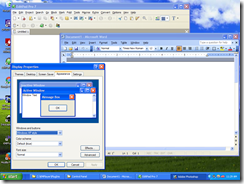 Windows itself would use those colours where appropriate, for things like title bars and title bar font, and Applications could merely use the setting to use the current system setting. (And respond appropriately to the broadcast message when system settings are changed to deal with those colours changing). The system’s shipped with various “Themes” which were effectively sets of those colours, and you could customize those colours to your liking. Up through to System 7, the Macintosh held fast to most of it’s original UI designs in terms of visuals. 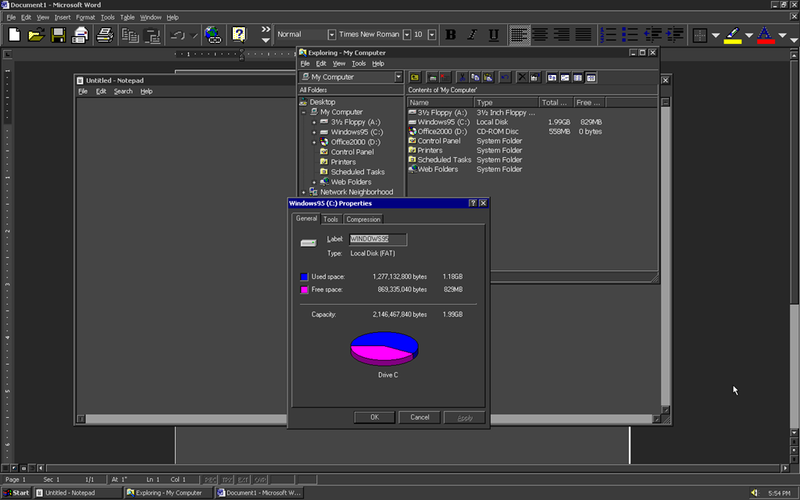 Originally grayscale, later support for colour did add little bits here and there, primarily for the icons, but the main User interface was largely white with black or gray lines, or with rather subtle colouring. Not to be outdone, Windows 95 introduced 3-D theming to the Windows environment, providing a similar set of changes to the standard appearance. 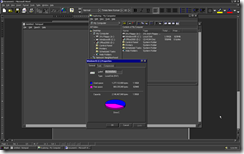 Unlike Appearance Manager, one could also set the “3-D Colour” which affected the colour of most elements. This facilitated the creation of what could be called “Dark” themes. 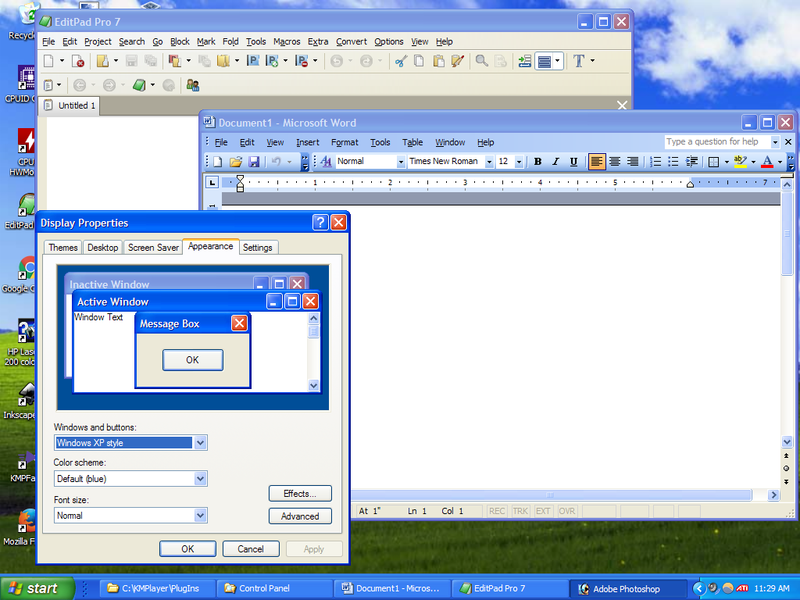 It wasn’t until Windows XP that Windows had a feature similar in concept to Mac OS’s Appearance manager, through the introduction of Visual Styles. Visual Styles worked in much the same way- a Visual Style defined custom images that were used to draw particular window elements, allowing a richer and more thematic styling to be applied. With Windows XP, in addition to the default Visual Style, there was also an Olive and Silver Theme/Visual Style that was included. 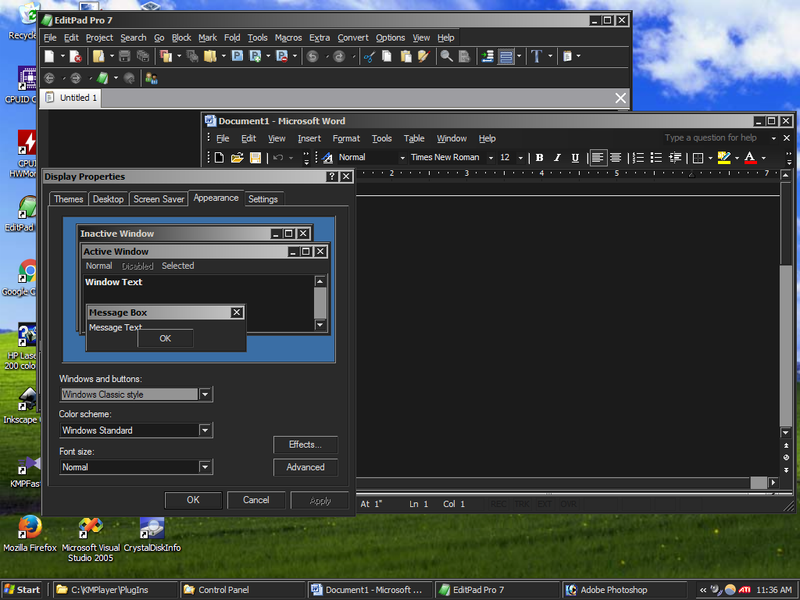 A “Theme”, which previously was a set of system colours, was changed to also include the Visual Style option. 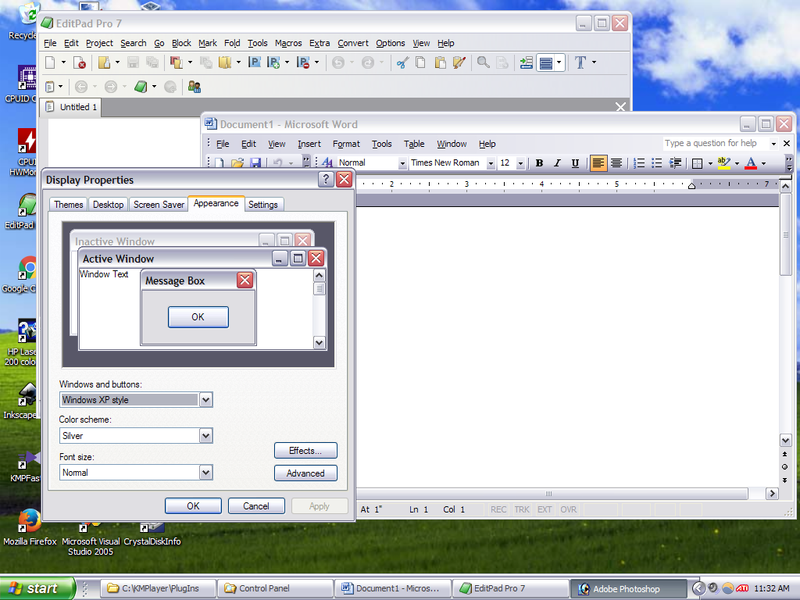 Additionally, you could decide to disable Visual Styles and use the “Windows Classic” Theme, which would not use the “Luna” Windows decorator. Interestingly, With the classic Theme style, one could adjust the colour options in much the same way as one could on previous Windows releases, creating “Dark Mode” colour schemes if desired. 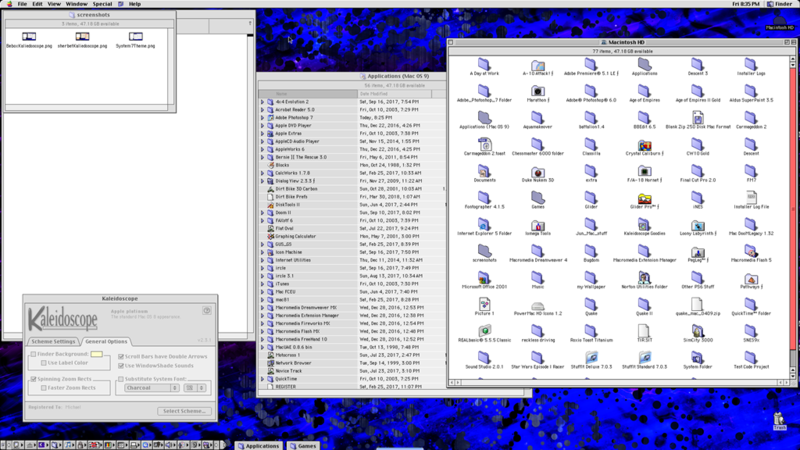 Around that same time frame, The Macintosh Operating System was migrated to OS X, something of a hybrid of the older Mac system and the NeXTStep Operating System. 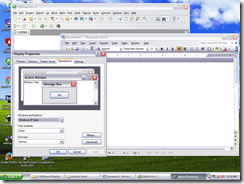 This introduced the concept of a “Composited desktop” to the mainstream. In a traditional desktop environment, it operates on a single output “image”. When you move a window, it get’s redrawn in the new location, and any revealed sections of the screen below need to be redrawn as well. A composited desktop keeps all that necessary information in memory- for example, it may hold the bitmaps that represent each window as a texture, and merely compose them together to create the final image, usually through the use of 3-D Accelerated Video hardware. With capable hardware, this approach was much faster and in general much cleaner. Internally, there was a framework for UI element drawing. 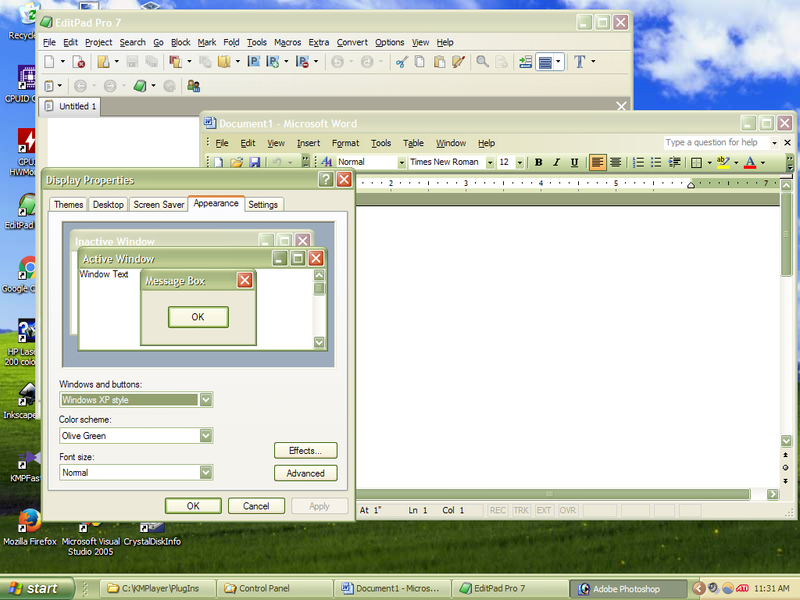 However, externally, it was necessary to use third-party software to reskin the styles of the OS (Shapeshifter, for example). 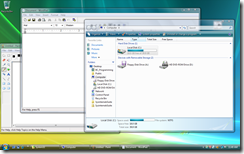 Windows Vista brought this same composited desktop experience to the Windows platform, this new technology was Aero. This underlying composited desktop experience has been used up through to Windows 10. Aero has similar capabilities to Luna, in that Visual Styles can customize almost every element of the system. “Aero Glass”, which many associated with Aero, was an enhancement to allow fancy affects to be done using the 3-D Rendering that is performed on the composited information. In it’s case, providing a sort of “translucent glass” effect which blurs the text behind the “glass” areas of a window (typically, the title bar). Basically, over the years, there have been a number of solutions and options for a central, system controlled set of colours and repeated thematic elements such as buttons. Which of course is what brings me finally, to why I find Windows 10’s dark mode both confusing and disturbing- it leverages none of these technologies! The Dark Mode feature of Windows 10 is implemented effectively as an on-off flag which does not change Windows behaviour. Instead, applications all need to check this flag and operate appropriately. the libraries behind UWP Apps will perform this check and change their visual theming appropriately. That is all. 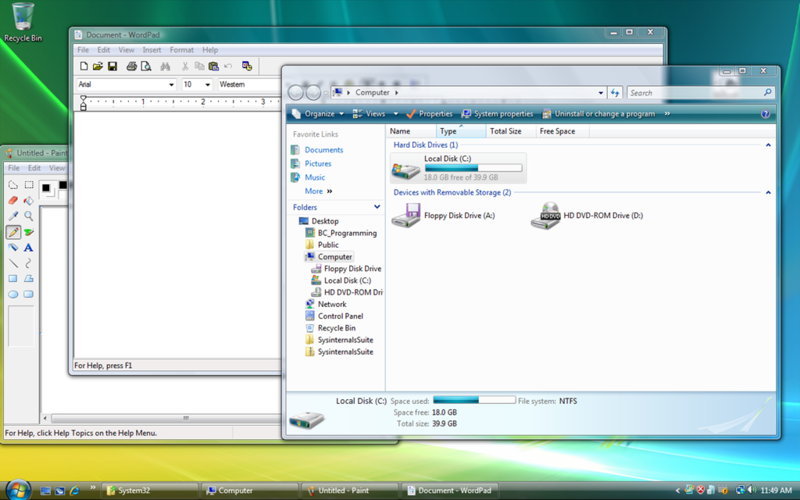 Win32 applications are unaffected. To implement Dark Mode in File Explorer, for example, Microsoft developers have changed File Explorer to see the flag and use different Dark colours for all UI elements if it does. But it makes no sense. Every piece of Windows now needs to be altered to allow for this. And even if every part of Windows has these changes made to support it, Third party applications aren’t guaranteed to support it, either. Lastly, nothing about the Dark Mode support is standard- From an application perspective, if Dark mode is on, you cannot use the Visual Style- so what should a Button look like in dark mode? A Combo box scrollbar? etc. Even the colours have no standard- it’s all up to the application. The implementation of Dark Mode makes no sense because it should have been a new Theme with appropriate dark colours that comes with Windows which also uses a new Visual Style that changes all the visual elements to have a darker colour. If Dark Mode is on, no application should see “white” for the Window background colour and be expected to disregard it if it seems Dark mode is on and use “A dark colour” of some sort that isn’t standardized for different elements. It is interesting to note that in many circles proprietary software is inherently considered untrustworthy. That is, of course, not for no reason- it is much more difficult to audit and verify that the software does what it is supposed to and to check for possibly security problems. However, conversely, it seems that a lot of Open Source software seems to get a sort of implicit trust applied to it. The claim is that if there isn’t somebody sifting through and auditing software, you don’t know what is in there- and, conversely, that if something is open source, we do know what is in there. But, I would argue that the binaries are possibly more trustworthy in attempting to determine what a piece of software is doing simply by virtue of it being literally what is being executed. Even if we consider the scenario of auditing source code and building binaries ourself, we have to trust the binary of the compiler to not be injecting malicious code, too. I’ve found that this sort of rabbit hole is something that a lot of Open Source advocates will happily woosh downwards as far as possible for proprietary software, but seem to avoid falling for Open Source software. Much of the same logic that get’s applied to justify distrust of proprietary binary code should cause distrust in areas of Open Source, but for some reason a lot of aspects of Open Source and the Free Software Community are free from the same sort of cynicism that is applied to proprietary software, even though there is no reason to think that software falling under a specific license makes it inherently more or less trustworthy. If we can effectively assume malicious motives for proprietary software developers, why do we presume the opposite for Open Source, particularly since it is now such a better target for malicious actors due to the fact that it is so often implicitly trusted? Source code provided with a binary doesn’t mean anything because- even assuming users capable of auditing said code, there is no way to reliably and verifiably know that the source code is what was used to build the binary. Trust-gaining exercises like hashes or MD5sums can be adjusted, collided, or changed and web servers hacked to make illegitimate binary releases appear legitimate to propagate undesirable code which simply doesn’t appear in the associated source code with a supposed release (Linux Mint). Additionally, The indeterminate nature of modern compilers means that even compiling the same source more than once can often give completely different results as well, so you cannot really verify that the source matches a given binary by rebuilding the source and comparing the resulting binary to the one being verified. Therefore, it would seem the only reasonable recourse is to only run binaries that you build yourself, from source that has been appropriately audited. Thusly, we will want to audit the source code. And the first step is getting that source code. A naive person might think a git pull is sufficient. But no no- That is a security risk. What if GitHub is compromised to specifically deliver malicious files with that repository, hiding secret exploits deep within the source codebase? Too dangerous. Even with your careful audit, you could miss those exploits altogether. Instead, the only reasonable way to acquire the source code to a project is to discover reliable contact details for the project maintainer and send then a PGP encrypted message requesting that they provide the source code either at a designated drop point- Which will have to be inconspicuous and under surveillance by an unaffiliated third party trusted by both of you – Or have him send a secure, asymmetrically encrypted message containing the source tarball. Once you have the source, now you have to audit the entire codebase. Sure, you could call it quits and go "Developer says it’s clean, I trust him" fine. be a fool. be a foolish fool you fooly foolerson, because even if you know the tarball came from the developer, and you trust them- do you trust their wife? their children? their pets? Their neighbors? You shouldn’t. In fact, you shouldn’t even trust yourself. But you should, because I said you shouldn’t and you shouldn’t trust me. On the other hand, that’s exactly what I might want you to think. "So what if I don’t trust their hamster, what’s the big deal"
Oh, of course. Mr Security suddenly decides that something is too off-the-wall. Hamsters can be trained. Let that sink in. Now you know why you should never trust them. Sure, they look all cute running on their little cage, being pet by the developers cute 11 year old daughter, but looks can be deceiving. For all you know their daughter is a secret Microsoft agent and the hamster has been trained or brainwashed- using evil, proprietary and patent encumbered technology, no doubt, to act as a subversive undercurrent within that source repository. With full commit access to that project’s git repository, the hamster can execute remote commands issued using an undocumented wireless protocol that has no man page, which will cause it to perform all sorts of acts of terror on the git repository. Inserting NOP sleds before security code, adding JMP labels where they aren’t necessary. even adding buffer overflows by adding off-by-one errors as part of otherwise benign bugfixes. Is it very likely? No. But it’s *possible* so cannot be ignored. Let’s say you find issues and report them. Now, eventually, the issues will be fixed. The lead developer might accept a pull, and claim it to fix the issue. Don’t believe the lies. You must audit the pull yourself and find out what sinister motives underly the so-called "fix". "Oh, so you thought you could just change that if condition, did you? Well did you know that on an old version of the PowerPC compiler, this generates code that allows for a sophisticated remote execution exploit if running under Mac OS 9?" Trust nobody. No software is hamster-proof. Nowadays, we’ve got two official ways of measuring memory and storage. They can be measured via standard Metric Prefixes, such as Megabytes (MB) or Kilobytes (KB), or they can use the binary prefixes, such as Mibibytes (MiB) and Kibibytes(KiB). And yet, a lot of software seems to use the former, when referring to the latter. Why is that, exactly? Well, part of the reason is that the official Binary SI prefixes didn’t exist until 2008, and were used to address growing ambiguities between them. Those ambiguities had been growing for decades. From the outset, when Memory and storage were first developed in respect to computers, it became clear it would be necessary for some sort of notation to be used to measure the memory size and storage space, other than by directly indicating bytes. Initially, Storage was measured in bits. A bit, of course, was a single element of data- a 0 or a 1. In order to represent other data and numbers, multiple bits would be utilized. While the sizes being in common discussion were small, bits were commonly referenced. In fact even early on there arose something of an ambiguity; often when discussing transfer rates and/or memory chip sizes, one would here "kilobit" or "megabit"; these would be 1,000 bits and 1,000 kilobits respectively, and were not base 2; however, when referring to either storage space or memory in terms of bytes, a kilobyte or a megabyte would be 1,024 bytes or 1,024 kilobits respective. One of the simplest ways of organizing memory was using powers of two; this allowed a minimum of logic to access specific areas of the memory unit. Because the smallest addressable unit of storage was the byte, which were 8bits, it meant that most memory was manufactured to be a multiple of 1,024 bits, possible because it was the nearest power of 2 to 1,000 that was also divisible by 8. For the most part, rather than adhering strictly to the SI definitions for the prefixes, there was a industry convention that effective indicated that, within the context of computer storage, the SI prefixes were binary prefixes. For Storage, for a time the same conveniences applied that resulted in total capacities measured in the same units. For example, A Single-sided 180K Floppy Diskette had 512 bytes per sector, 40 sectors a track, and 9 tracks a side. A single sided 180K diskette had 512 bytes a sector, 40 sectors per track, and 9 tracks per side. That was 184320 Bytes. In today’s terms with the standardized binary prefixes, this would be 180KiB. 360K Diskettes had a similar arrangement but were double-sided. they were 368640 Bytes- again, Binary prefix was being used in advertising. Same with 720 K 3-1/4" diskettes. 512 bytes/sector, 9 sectors per track, 80 tracks/side, two sides. That’s 737280 bytes. or 720KiB. The "1.2MB" and "1.44MB" Floppy diskettes are when things started to get spitballed by marketing departments for ease of advertising and blazed an early trail for things to get even more misleading. The High density "1.2MB" diskettes were 512 bytes a sector, 15 sectors per track, 80 sectors per side, and double sided. That’s a total of 1,228,800 Bytes. or 1200 KiB, But they were then advertised as 1.2MB, Which is simply wrong altogether. It’s either ~1.7MiB, or it is ~1.23MB. it is NOT 1.2MB because that figure is determined by dividing the KiB by 1000 which doesn’t make sense. Same applies to "1.44MB" floppy diskettes, which are actually 1440KB due to having 18 sectors/track. (512 * 18 * 80 * 2=1474560 Bytes. That is either 1.47456MB, or 1.40625MiB, but was advertised as 1.44MB because it was 1440KiB (and presumably easier to write). it’s unclear when the first intentional and gross misrepresentation of HDD size was actually done where the SI Prefix definition was used to call a drive X MB. But, it was a gradual change. People started to accept the rounding and HDD manufacturers got more bold- eventually one of them released an X MB Drive that they KNEW full well people would interpret as X MiB, and when called out on it claimed they were using the "official SI Prefix" as if there wasn’t already a decades old de-facto standard in the industry regarding how storage was represented. For the most part this confusion persisting forward is how we ended up with the official Binary Prefixes. And yet- somewhat ironically – most OS software doesn’t use it. Microsoft Windows still uses the standard Prefixes. As I recall OSX provides for it as an option. Older Operating Systems and software will never use it as they won’t be updated. The way I see it, HDD manufacturers have won. They are now selling Drives listed as "1TB" which are 930GiB, but because it’s 1,000,000,000,000 bytes or somewhere close, it’s totally cool because they are using the SI prefix.